All of us, by virtue of our Baptism, are called to be faithful and active disciples of Jesus Christ. We live out our baptismal call in so many different ways depending on our age and circumstance in life. It can be in our school or university, in our workplace, in our sporting and social activities, in our family, community and Parish involvements. In all these situations, we witness to our faith in Jesus Christ and live out the message of the Gospel. 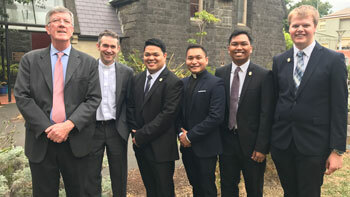 From amongst his disciples, the Lord calls some to serve in a special way through consecrated Religious Life as Sisters and Brothers and others as Priests. The great majority will be called to the vocations of Married and Single Life.